HTML5 Multipurpose Free Bootstrap 4 Portfolio Template Aside, Free Download Now. 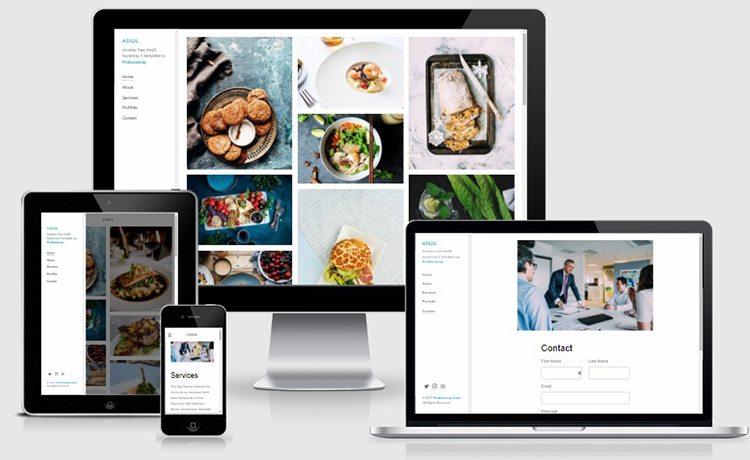 A brand new HTML5 Multipurpose Free Bootstrap 4 Portfolio Template. Perfect match for your blog, photography, company, personal or agency portfolio website. 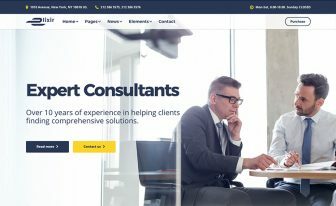 Searching for a high-quality HTML5 template to showcase your photography, personal or agency website? Look no further, a brand new, multipurpose, HTML5 Free Bootstrap 4 Portfolio Template Aside is here. 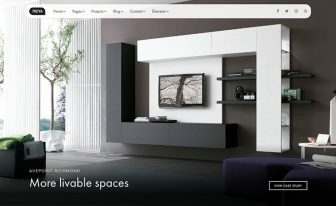 Themewagon has always been the place for you to get best free HTML5 templates. So, it is the time to present another top-class free multipurpose template. Let’s get going. Is this Free Bootstrap 4 Portfolio Template for you? 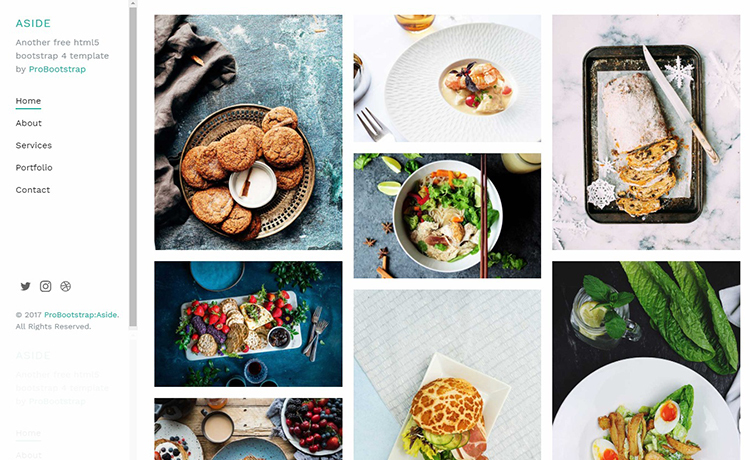 Do you want to have a clean and modern blog or photography website? Do you think your target is to get a beautiful portfolio website to showcase projects of your office, company or small start-up agency? That even, without giving too much of an effort? Surely, this template is made for you. Now, let’s stop beating around the bush. Instead, have a glimpse of some lucrative features this Free Bootstrap 4 Portfolio Template has to offer. It’s not that you have to, but if you’re even a little bit familiar with recent technologies or trends about responsive websites, you must have heard the name of popular CSS framework Bootstrap. One framework behind the responsiveness of thousands of websites. Now, a new version of any product is typically better than his antecedent. And Bootstrap 4 is the new craze out there! All these words are here to acknowledge the super responsiveness of Aside. As it is created with Bootstrap 4 beta, down to single pixel perfectness is assured. 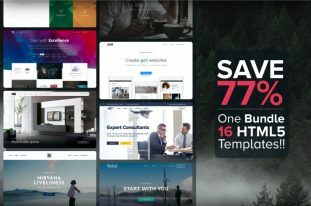 No matter where you visit your site from, if it is created with this Free Bootstrap 4 Portfolio Template, it will never lose its astonishing look. Clean, minimal and attractive design of this free portfolio template creates a pleasant environment right away. Afterwards, all the other necessary portions come into play. This Multi-Page template has tons of features to offer as a free template. To begin with, it’s sticky navigation bar has a place on the left side. It provides absolute comfort to the visitors to navigate through multiple pages. Moreover, you can find the social media icons at the bottom of sticky navigation section. Latest technologies like jquery and CSS animation makes it more efficacious. Smooth animation upon hovering over any image is a direct result of that. As the template have mobile-ready concept, off-canvas menu is another nice addition. It automatically activates whenever you browse from a smaller screen. 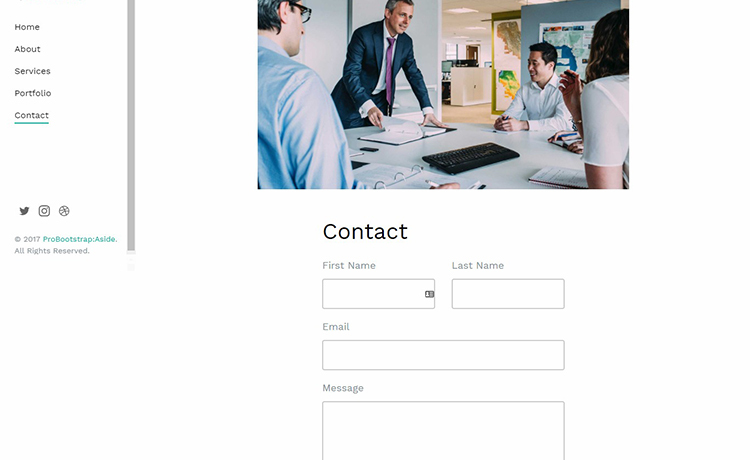 At last, the template consists a fully working contact form. It functions as a bridge between you and your site’s visitor. Probootstrap created and made available this template for free. How amiable they must be! So, don’t hesitate to give them a big round of applause! So, this is it, another top-notch, free template for you. 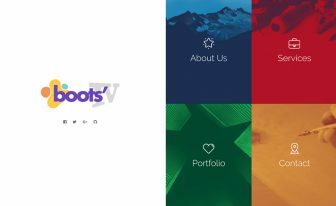 Get rid of all of your hesitancy and download this Free Bootstrap 4 Portfolio Template right away! Meanwhile, there are a lot more to discover at Themewagon. 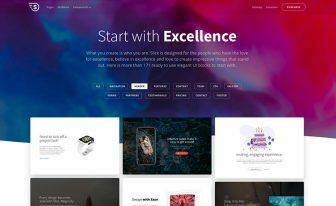 Collection of Free & Premium templates here will WOW you for sure. Then, our blog is also filled with regularly updated and trendy affairs. For example, here goes a post about 100+ High-quality Free Templates. Don’t forget to visit there too! Such a worthy multipurpose template.